Buy pacific gas and electric? My best friend works for the beleagured Northern California utility and says all the internal talk is that they are going to pull through this ordeal just fine. Putting his money where his mouth is, he just bought $65K of PCG stock in his 401k there. Is buying this stock now applying the mantra of “being greedy when others are fearful”? Is anyone else buying this stock at this time? Re: Buy pacific gas and electric? If one wants to gamble perhaps options or LEAPS would yield a bigger return and reduce the loss in case of a wipeout. The company's operations may well keep continuing, but under new ownership after all the current shareholders lose all their equity in bankruptcy. It's more of a gamble than an investment. I have not studied the BK filings in detail, but often in a bankruptcy existing shareholders have the value of their equity pushed out/down. It seems to be a lot of concentrated risk given your friend is also employed there. Your friend needs to rethink their strategy immediately. Even if in some miraculous chance PGE is able to avoid the penalties and avoid their impending bankruptcy that is a massive amount of risk to take on. Not only is their job on the line, they now put $65K in the same asset that guarantees their salaried annual income + bonus. Even if they had insider data regarding the filings using that data is against the law and they could be questioned by the SEC for insider trading. Stay the course and follow the market. Speculation is always losers game. If someone is "sure" PG&E is going to go up they may do much better if they trade in a taxable account to take advantage of lower long-term capital gains. Any profits in a 401K would end up getting taxed as ordinary income when the distributions are received. If he bought in the last 10 days or so, and before 3 pm ET today, he made a very nice return. Should he hang on, or bail out? Who knows? And for the record, as a Boglehead, I do not condone that course of action and would never take it myself. Sounds like I good idea...but a very risky one too. Do you have a mastery of the Utilities industry? Do you understand what the stock should be valued compared to what it is? Are you comfortable with taking a massive risk? You will be advised to only buy index funds on this blog...which is what I do (and have mostly done in the past). There are "vulture investors" who have full time jobs analyzing and investing in bankrupt companies. These are the people your friend is going up against. Does your friend know more about how bankruptcy works than they do? In particular, the biggest risk is that in bankruptcy, the company will probably keep going, but the shareholders usually lose their entire investment. "Be greedy when others are fearful" is sometimes just overconfidence writ large. 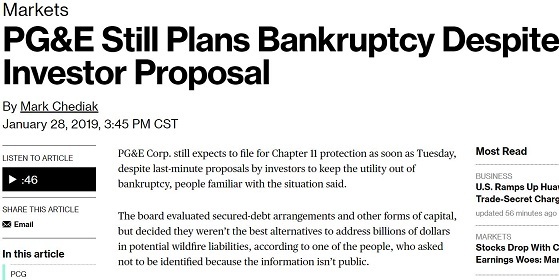 Unless you know how they are treating equity in the Chapter 11 Plan of Reorganization, you will be blindly buying into a world where equity (which is on the bottom of the bankruptcy distribution hierarchy) is usually cancelled out. Your odds would be better if you go to Vegas and put your money down on red or black on the roulette table. At least there you would have almost a 50% chance of doubling your money. OP's friend is probably risking his retirement. Isn't investing your 401k in shares of the your employer's company the opposite of diversifying? After a 15-month investigation into the deadliest of the 2017 Northern California wildfires, Cal Fire on Thursday announced that PG&E equipment was not responsible for starting the Tubbs Fire — the catastrophic blaze that swept over the hills from just outside Calistoga into Santa Rosa. In September, then-Gov. Jerry Brown signed a package of bills aimed at keeping Pacific Gas and Electric and other utilities solvent as they combated possibly billions of dollars in liability from wildfire lawsuits. The controversial law, SB 901, allowed utilities to issue bonds to help pay for their wildfire liability costs, enabling those costs to be passed on to ratepayers, among other things. But now that PG&E says it is filing for bankruptcy protection, the state’s top two assemblymen overseeing utilities tell KQED News that the plan to extend that law to 2018 is off the table. I don't know what is going to happen to PG&E, but I do wonder, if one worked for a large company that a significant number of people perceived was having a very good news day, might the general talk tend to be that "things were going to be alright," regardless of how things turn out? I hope congress will come up with something like FDIC to protect rate payers and utility companies. I cannot comment on the specific stock. Generally this is just a horrible idea. Doubling down on the stock of your own employer, especially when in bankruptcy. Remember that lineman at Enron who worked for the Portland utility? He had all of his 401k in company stock, Enron took it over and exchanged it for Enron stock in a share-for-share takeover. He lost his entire retirement savings when Enron, several times voted "world's most admired company" and "America's most admired utility", went bust. (similar things happened to employees of Nortel, and of Worldcom, and of Lehman Brothers). See the movie "Smartest Guys in the Room" - documentary. A classic. And taking a bet on bankruptcy proceedings which could last for years. In bankruptcy, different classes of creditor play hardball. Vulture funds acquire the debt of the company, which is trading at a significant discount to its par or face value, and hire very experience attorneys who play hardball in court. This can take years. Shareholders are usually just spectators to this game of legal corporate hardball. Maybe they get something, maybe they get nothing. But creditors get the feed first - that's the law. It is quite feasible to earn money on stocks which are depressed over hype when that hype focuses on perceived shortcomings which are over-blown and which are handily overcome by the strength of the company in time. In fact, this can be a fabulous strategy to buy on irrational dips drive by short term news to which the market or company management over reacts. In the specific case at hand, I am not convinced anyone is over-reacting. The fire damage was real and enormous. If PG&E gets stuck with the costs, they could be bankrupt I suppose. I don't really know their financials other than they have a lot of infrastructure and customers. In my state they sort of deregulated electricity, providers have sprouted like weeds, and prices are half what they are in Calif. This seems like at least as big a threat to PG&E financials, although I don't know if CA is considering it. I am likely wrong but I was always under the impression that the common stock gets completely wiped out in a bankruptcy and the holders get nothing? In strict legal principle, that is the case. I should note I am not an expert in this, and certainly know very little about American commercial law. If the assets happened to be sold for more than the liabilities (debts, trade suppliers, etc.) then the surplus, legally, belongs to the shareholders - a solvent liquidation. In practice that almost never happens. However to avoid full bankruptcy and liquidation (Chapter 7?) there is typically a deal struck between classes of creditors. Shareholders do have some legal rights (as the company is not actually bankrupt, just a standstill in creditors has taken place (Chapter 11)). And so, they are sometimes able to extract some value. If a debt for equity swap takes place where creditors receive shares in the company, a few per cent is often left over for shareholders to get them to vote to agree the deal. One of the problems with the Lehman Brothers bankruptcy, according to a leading US insolvency expert who was interviewed in "Inside Job", the documentary, is that US Treasury officials did not understand the difference between Chapter 11 in the US and bankruptcy in England & Wales, which is basically Chapter 7 (the legal entity is dissolved and the receiver appointed by the courts liquidates the assets). Lehman in London was a huge business and placing it in bankruptcy started a worldwide financial panic - every financial institution in the world started liquidating assets and pulling in loans, trying to maximize its cash. Yes, yes it does. Many do get a post card though telling them their equity has been dissolved in bankruptcy though . Did he buy it before or after yesterday afternoon's 74% share price increase just before market close? This was sparked by new regarding another fire that they were found not to be at fault for but not the fire that prompted them to seek bankruptcy in the first place. If he bought before the share price spike he's probably very happy now. He will do one of two things: realize he got lucky and sell now or 2.) it will confirm his belief in his investment prowess and he will be even more likely to stay invested. Hopefully he does #1 since he is taking on a lot of risk by being employed with them. He needs to diversify his investments away from his employer, not further concentrate his risk position. FYI - There is a similar discussion here: PG&E stock or ETF at Vanguard?, where the OP is asking "How can I buy it?". In this discussion, the OP is asking "Should I buy it?". I thought trading based on inside information was illegal. Most ground level employees don’t know anything material. The ones that do would be prohibited from trading, but companies make sure they know who they are. Well, this will be an interesting stock to watch to see if the friend is making the right call. While I do believe in buy low, I prefer to concentrate my risk in companies that weren’t being blamed for the recent horrific deaths of a large number of people. There surely is bankruptcy risk from liability? No? Not an investing expert, but this exemplifies one of the strengths of the Bogleheads investment strategy - buy the haystack. Ouch. $65k gone. That has to sting. Don't dance on the grave of PG&E shareholders quite yet. There's a reason the stock closed above $12 today and last traded at $11.68 in after hours trading. And, if the OP is to be believed, her friend could have purchased the shares in the $6ish range. So he might have doubled his money in a matter of days. There are some smart money managers who believe that the litigation will not wipe out equity in Chapter 11, assuming the Board authorizes such a filing. You do not have to be insolvent to file for bankruptcy protection in the United States. It's entirely possible the BK is designed, in part, to create one forum to handle all of the litigation that is going to ensue from the 2017 and 2018 incidents. It's far more efficient to have hundreds of adversary proceedings in connection with an administrative case in Bankruptcy Court than it is to fight those cases in State and / or Federal Court, or dealing with a class action. This is a really weird situation. I wouldn't touch the stock either way. Someone is going to get burned (no pun intended) and someone is going to print money. I simply have no idea who is who (the lawyers, however, will make oodles of money). It's official -- PG&E filed for Chapter 11 today. Right now, the stock is up 6%. Who knows where it'll ultimately end up, but this is going to be a fascinating turn of events. Is your friend a high-level manager or executive? They tend to have much better information than those who aren't. Even then, I don't see what's so special about the company. Pulling through a crisis doesn't necessarily mean it's a superior long-term investment to the broad market. It's a lot easier to apply that mantra when you're buying index funds. Even in the depths of 2008, I had a reasonable assurance that VTSAX was going to be have a positive value at the end of the day. I couldn't say that if I'm buying individual stocks. I do take flyers and gamble from time to time. But I would only do that with money I could afford to lose. No, I'm not buying this stock. Dude has doubled his money, what are you talking about? uh, I'd sell. sell. sell.... Putting all your eggs in one basket, not the BH way..
Well, the stock was up 16.49% today following news of the bankruptcy filing this morning. A very good friend and former long time employee of PCG advised me the same a week ago. Today it is around 15/share at close. On Morningstar, the average history of the fund over a longer period of time is from 15 to 20 with various highs and lows. I am a dedicated "Boglehead" and "walk the talk" with Bogle concepts. Thus, although I find the informed or uninformed speculating in single stocks interesting, I don't dabble. OTOH. . . . "if" I had bought 500k worth of PG&E at the low, I'd have doubled my money to a very cool 1 mil. Bloody hell. The nation's electric utilities are already for the most part publicly-traded monopolies, protected from competition and essentially able to operate at will. Part and parcel with this is outsize executive compensation to senior leadership for... doing what exactly? "Slash customer service (further) and push through a rate hike. All in a day's work!" What further protection for them would you suggest? 1. Unless a large part of CA wants to freeze in the dark very soon, PG&E must survive in the short-term. 2. Unless CA wants to return to the stone age, the physical plant must survive, be kept operating indefinitely, and even expanded. And, the employees who operate that physical plant must keep it going and will therefore stay employed. There just is no spare electric grid, and the state is not going to go without electricity. As unpopular as it may be, even the most dense politician in CA understands these points. The real issue is whether #2 requires the preservation of PG&E or whether it can be done by having a new entity take over the physical plant and low to mid level employees. To me, the stock price is a pure gamble, more risk that I would want to take on. Survival as a company depends entirely on the state legislature and the employees union. It has been nearly a month, and PCG stock continues to climb higher. My friend has nearly doubled his $65K initial investment. I doubt that he has any plans to harvest his profits now though; I think he’s going to ride this all the way to the end. I’m intrigued by this case. In particular, why the stock seems to be climbing almost daily. I haven’t seen any major updates since they filed for Chapter 11. I guess there are a lot of insiders that know something? One detail that is usually overlooked: Owners of the stock "PCG" do not own the customer facing electric and gas utility. Instead, they own a holding company that in turn owns the utility. I'm not sure, but I think the holding company has other assets. PG&E already went through bankruptcy a decade or so ago. That time PCG stockholders came through just fine. Pacific Gas & Electric Corp. (PCG) said Thursday it took at $10.5 billion charge linked to last year's deadly California wildfires and cautioned that there is "substantial doubt" over the utility's prospects as a going concern. PG&E shares were down 1.1% to $17.60 on Thursday. This is an interesting thread. It looks like the stock jumped over 20% on Friday, and had been steadily climbing since the OP posted. Sounds like their bet is paying off nicely.